The city of Flowood is nestled between Jackson and Ridgeland, Mississippi in Rankin County. In the heart of Flowood lies the Jackson-Evers International Airport. 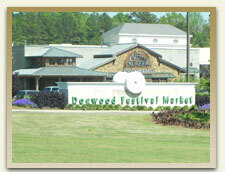 This bustling town is home to a multitude of shops, including those situated in the popular outdoor shopping center called Dogwood Festival Market & Promenade. As a matter of fact the ten (10) miles of shops on Lakeland Drive is one of the fastest-growing commercial areas in all of Mississippi. Data from the 2000 census listed Flowood as home to 4,750 people and 2,130 households. It’s easy to see why education is a huge part of Flowood’s identity. Even though the town is only sixteen (16) miles, it is home to seven (7) public schools and two (2) private schools. Jackson Preparatory School is located in Flowood and it is the largest private school in all of Mississippi. Flowood is also the home of G. Chastaine Flynt Memorial Library. This 25,000 square foot library allows people of all ages and backgrounds to continue their education. Also located inside this library are conference rooms so businesses and local organizations can hold meetings. Families in Flowood have opportunities to enjoy sports and the outdoors. Within Flowood there is the Adams Park, Crystal Lake, Flowood Liberty Park, and Winner’s Circle Park. Flowood is home to one of the most premiere, public golf courses: The Refuge. Plans are under way to develop the lands surrounding the Refuge in an effort to create more jobs and more businesses. The Flowood Fire Department has helped earn the city a class five (5) rating giving Flowood the honor of having the lowest fire rating in all of Rankin County! Coxwell & Associates have helped serve the citizens of Flowood for over 30 years. We understand that accidents happen and sometimes bad things happen to good people. Our attorneys will listen to your needs and concerns and choose what is best for you. Whether you have been involved in an accident, have been arrested, or convicted of a crime that needs to be appealed, the attorneys at Coxwell & Associates are here to listen and help do what they can to get your life back in order. That is what makes Coxwell & Associates different from other attorneys; we pride ourselves on making a difference in communities like Flowood. We have earned a reputation across Mississippi as being stellar advocates for our clients. We pride ourselves on making a difference in communities like Flowood. If you are a Mississippian in need of the services for financial fraud and criminal defense and personal injury, product liability, or other serious injury case, please call us at (601) 948-1600. Our office is located about twenty (20) minutes away from Flowood in Downtown Jackson. You can easily access our office from I-55 North. Take the High Street Exit and go right. Continue up High Street until you come to North State Street (approximately 4-5 traffic lights). Turn left on North State Street and you will only have to travel a few hundred feet before you see the beautiful, white antebellum home on the right that is home to Coxwell & Associates. There is a black and white sign out front. As you approach the office turn left on College Street and park behind the office. The entrance is in the back of the building. We offer convenient and free parking for our clients in the lot behind our renovated house on 500 North State Street.